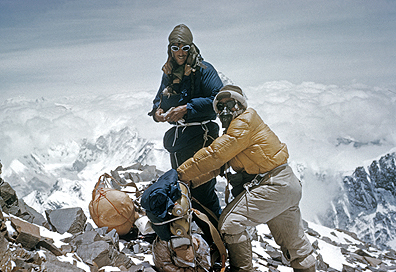 Tenzing Norgay and Edmund Hillary wear decorations given them by the Kingdom of Nepal after their historic ascent of Mt. Everest. 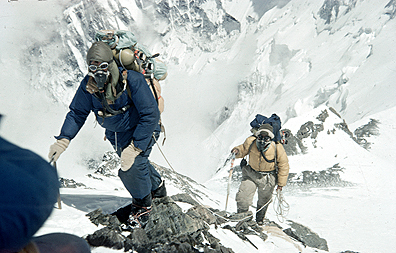 May 29 will mark the 61st anniversary of Edmund Hillary's historic summit of Mount Everest. In the waining months of 1991 the American Academy of Achievement conducted an interview with Sir Edmund Hillary about his historic 1953 climb entitled From Beekeeper to World Explorer. Watch the excerpt below to hear several challenges of being a trail blazer to the top of the world and about how he wouldn't have made it without Tenzing Norgay, his sherpa guide. This climb season Jim Geiger went to Everest to attempt to be the oldest American to summit the tallest peak. When he got back at the beginning of the month he had this to say about the deadliest avalanche that killed 16 Sherpa.